Our first full day in Wales was hiking up Mt. Snowdon. The weather was perfect. Sunny skies, cool air and excellent visibility. I brought my trusty backpack, hiking boots and trekking poles that accompanied me last year in Spain during our Camino de Santiago. Although Mt. 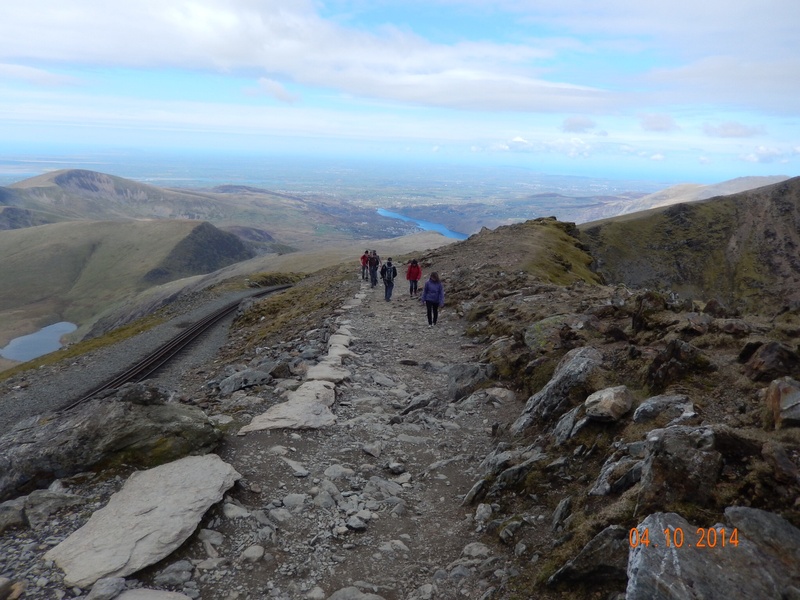 Snowdon is the second highest peak in the United Kingdom, it is only 3,650 feet above sea level. How challenging could this hike be when I’ve hiked to the summit of several Colorado mountains exceeding 14,000 feet elevation? My house in Colorado sits at about 6,000 feet. How hard could this be? Learning that Sir Edmund Hilary trained on Mt. 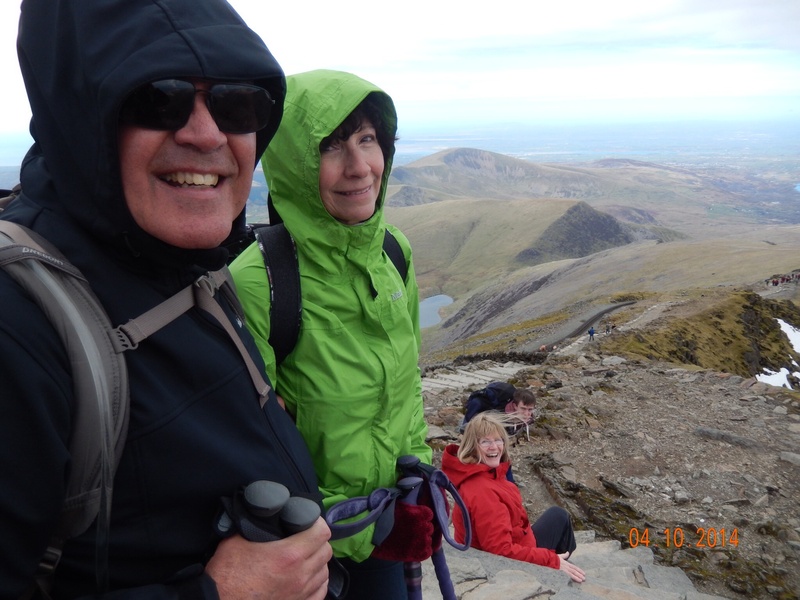 Snowdon for his historic climb of Mt. Everest didn’t dissuade me from thinking this was going to be that big of a challenge. Funny how life is always teaching me how perilous it can be when I take something, anything, for granted! After leaving the trailhead, I was immediately reminded of my best mate’s sage advice last year regarding training for our pilgrimage hike across northern Spain. The 6 Ps. Proper Planning Prevents Piss Poor Performance. 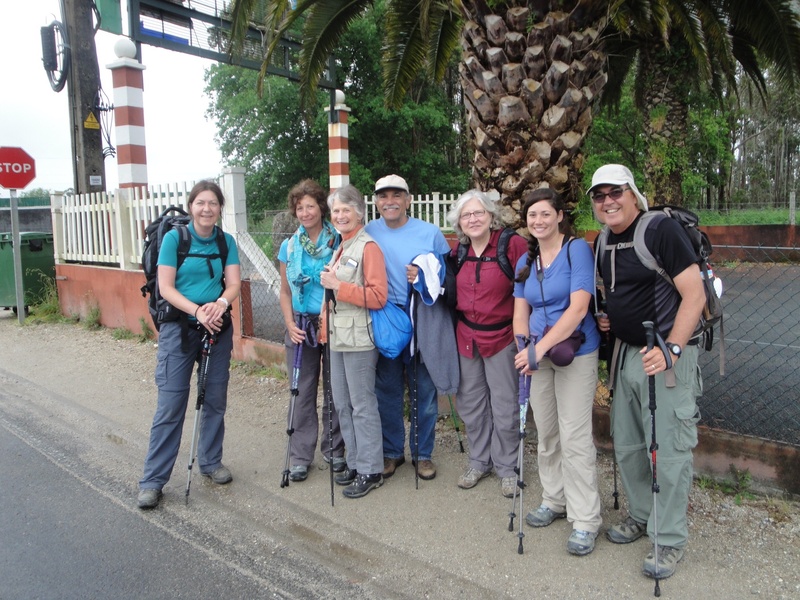 When Nancy, Andrea, Heike and I reached Santiago de Campostela, we had well developed “walking legs.” After returning to Colorado from Spain, I have done precious little training. An occasional 3 to 5 mile walk with Nancy but that’s about it. As I result, I’ve gained weight and have declined measurably in the “fitness” scale. Taking my body for granted always comes with a price tag when I act like I’m still in my 20’s. I soon found out that this 61 year old body doesn’t recover like it used to! Mt. 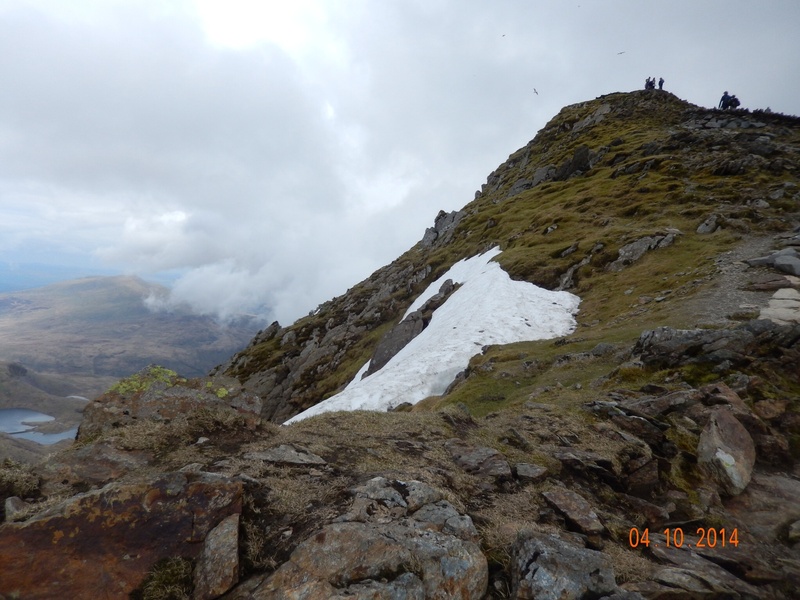 Snowdon may not be as high as the Colorado Rockies but it is plenty challenging. The trail is very easy to follow as it is well traveled but it does have several, steep segments that will accelerate one’s heart rate and burden one’s breathing. It is also a 6 mile hike to the summit of near continuous elevation gain. 3,000+ feet elevation gain is still a challenge whether it is in Colorado, the Appalachian Mountains or Snowdonia in Wales. Don’t take anything for granted! The same person, Carl, who taught me the 6 Ps last year was at my side today. He is intentional about his training, whether it’s riding his road bike, working out on his rowing machine, walking with his lovely wife, Marion, or eating healthy. He’s mindful of the 6 Ps. I am not. Two years ago while on a Southwestern USA holiday, Carl and I made a bet that we’d lose weight and get in shape. At a popular micro brewery in Durango, Colorado we each bought a biking shirt for our training rides. Carl’s biking shirt is now too big for him. Mine? I can barely squeeze it on. Now back to Mt. 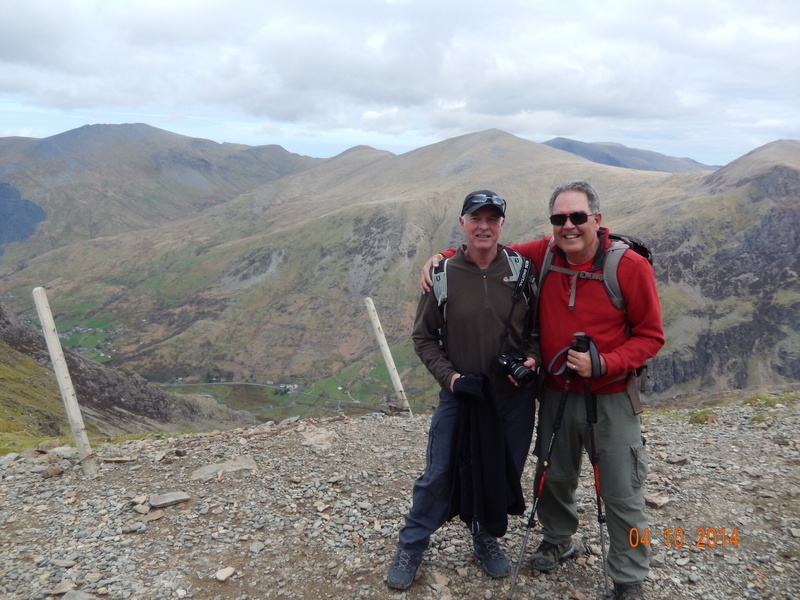 Snowdon in the heart of Snowdonia National Park. As we ascend this mountain my breathing is increasingly becoming more labored. In the meantime, Carl is carrying on a regular conversation with me as if we’re as relaxed as two mates sharing a pint at the local pub. Marion and Nancy are actually ahead of us most of the way. The scenery is spectacular with the valleys and lakes below splashed with sunlight while the sheep are lazily grazing on the steep mountain sides, the passenger train carrying tourists up the mountain while at least a hundred hikers are either ascending or descending the summit. The path is very rocky. Flat rocks configured as steep steps followed by loose rocks constantly testing the flexibility of your ankles then stretches of worn down earth only to be repeated by more steep steps, loose rocks and feet pounded earth. This is turning out to be a not so trivial a hike! As we get closer to the summit our narrowing trail is more exposed and the wind and cold is reminding us all that this is a “proper” mountain and that she will not relinquish her summit so easily. After three hours hiking a little more than 6 miles we reach the summit! By now, the wind is biting cold. The summit is surprisingly small, maybe about 10 to 12 feet diameter. I have always had a very healthy fear of heights and standing at the summit marker and looking out along the spectacularly breathtaking panoramic views, I start feeling wobbly knees. Time for me to descend! On a clear day from this vantage point, one can see Wales, England, and Ireland. I took a quick picture, Carl took a quick two pictures for me and before you knew it, I was carefully negotiating the steep steps descending the summit. We’re only half way back to our starting point so now we get to walk the 6 mile path in the opposite direction. For me, descending a mountain summit is every bit as challenging as ascending that mountain. I really need to concentrate on each step to ensure I have secure footing and keeping my balance. There is also a different workout of my muscles going down. Instead of my lungs and thighs that seem to be the focus when hiking upward, my knees, tendons, cartilage and muscles around my knees along with my feet seem to taxed the most. About halfway down the mountain we stop at the only available cafe where we ravenously devour an oatmeal energy bar and a cup of tea. It could not have been more delicious! It took us 2 hours to reach the trailhead for a total of 5 hours of hiking the more than 12 mile round trip. 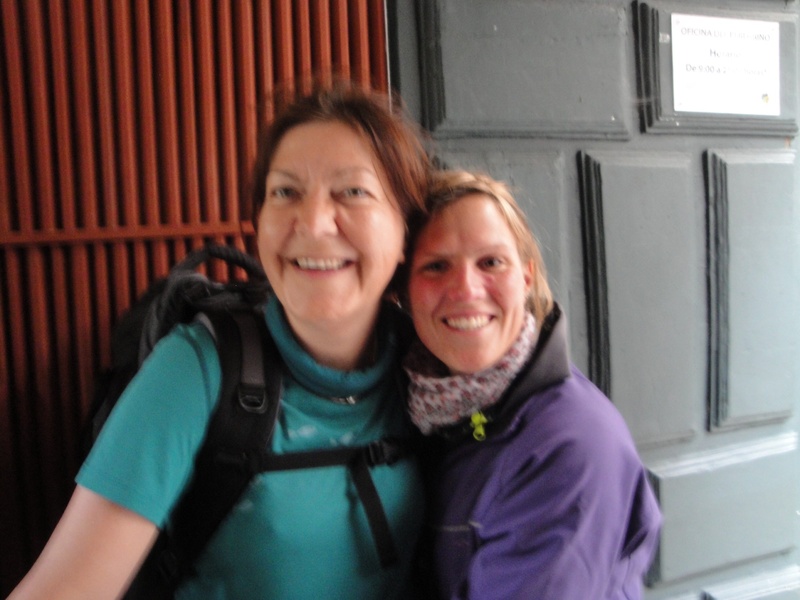 I hope that I will be up to backpacking with Nancy and Heike from Cologne to Aachen 11 days from now! 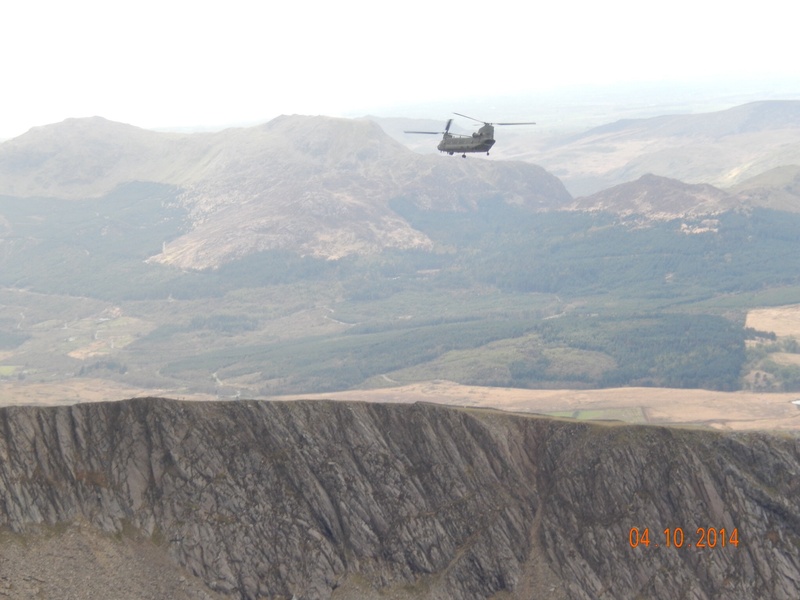 Chinook Helicopter on mountain rescue training. Our descent down the mountain. Carl taking a picture of Joe, Nancy and Marion at the summit! Notice how small the summit is on the upper right hand corner of this image. 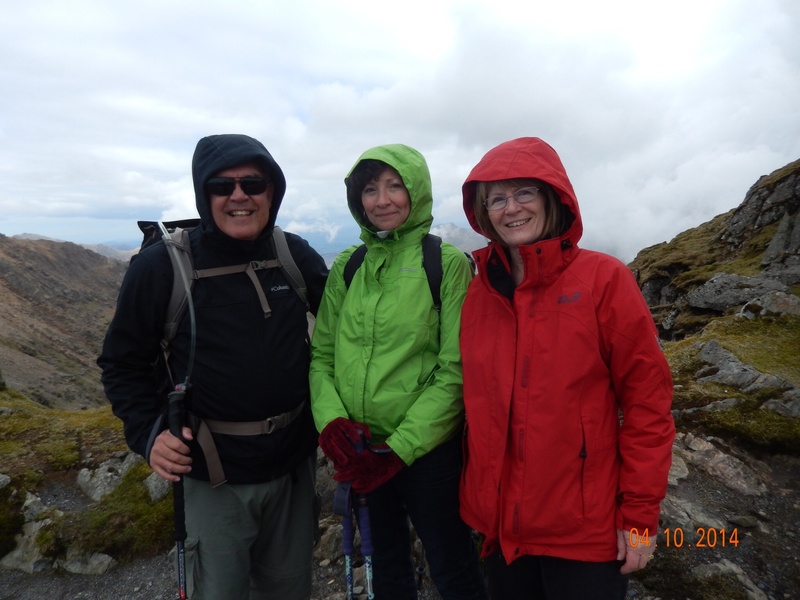 As we near the summit, Marion, Nancy and I put on all our warm clothes! We’re about 3/4 of the way up. The edge of the path behind us falls dramatically to the valley floor below. Nancy, Marion and Carl early into our ascent of Mt. 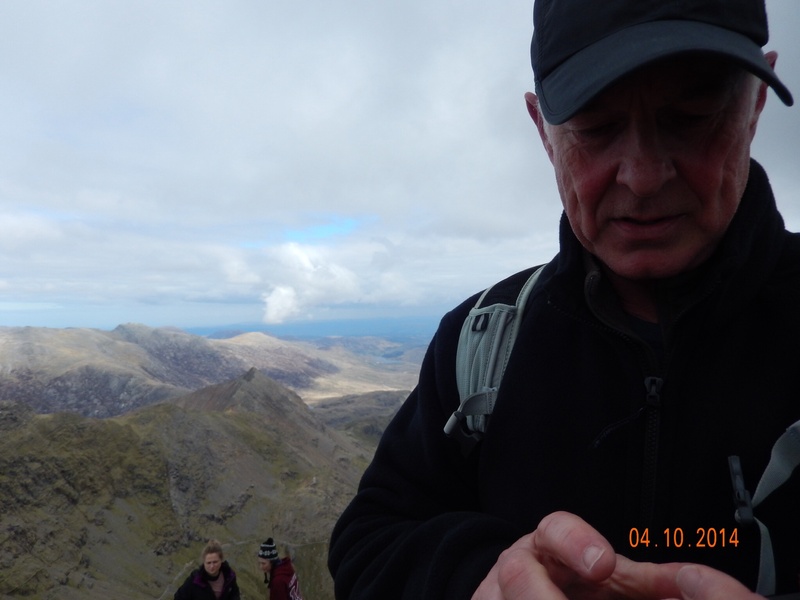 Snowdon. As we ascend, the beautiful Welsh countryside becomes more evident. Carl and I at the LLandberis path trailhead of Mt. Snowdon. For the first time, Nancy and I flew to Europe on Icelandair. We booked these flights many months ago and secured excellent air fares. To our surprise, Icelandair is currently on strike. As a result our takeoff from Denver was delayed nearly two and half hours. We were given good seats with additional leg room. The flight was from Denver to Keflavik Airport near the Icelandic capital of Reykjavik. After the seven and a half hour flight we had to wait an additional two hours before leaving Kevflavik to London Heathrow. This last 3 hour leg was most enjoyable as there were four Icelandic couples who were sitting around us and all were in a highly festive and gregarious mood. Being the flaming extrovert that I am, I commented to who I judged as the “ring leader” of the group who much I was enjoying their energy and seemingly very happy attitudes. He smiled and we started a very genial conversation. He was part of four couples who were going to Bali in Indonesia for a Holiday. Because of the lengthy delay in leaving Kevlavik Airport, they missed their connecting flight in London Heathrow. They would not be leaving for Bali until late Tuesday evening making an extremely long day for their group. However, they simply laughed about the delay and simply embraced a very positive attitude. You talk about “glowing with the flow!” He went on to share with me about his life in Iceland since I was keenly interested in learning more about a country and people I honestly know very little about. The first think I asked him was about his language. I’ve lived in Germany for three years more than 33 years ago. I still know a lot of German words because so much of our own English language comes from German. I also grew up with Spanish around me 24/7 because that’s the language of my parents and all of my preceding ancestry. Moreover, I learned a bit of Korean and learned to read and write Korean during the two years I lived there. But Islandic? It sounds like no language I’ve ever heard before. Until this evening. More on that later. This fellow traveler told me that the Icelandic language originated from the Vikings who first populated this island nation over a thousand years ago. Their language is more related to the ancient Norse people who have since evolved into modern day Norwegian. Therefore, if I understood him correctly, the current Icelandic language has more in common with the language of the ancient Vikings than the current day Scandinavian languages. They are also very informal people taking on no pretentious attitudes. From the lowest people in their society to the President of their Nation, everyone is addressed by their first name. They seem to be quite proud of that. When I asked what he does for a living I learned that he is a commercial fisherman in the second largest city in Iceland. He owns a 3,000 ton ship which is actually quite large. He employs a crew of 26. He’s a young looking grandfather of 2 grandchildren and four children. He showed me pictures on his iPhone of his family, home and ship. To keep their festive mood flowing I looked at them, knowing full well that they speak excellent English, that when they arrive in Bali they need to “party like rock stars!” They all gave out a big, hearty laugh and agreed that they would make this Holiday memorable. I then followed with, “when you leave Bali, the locals should be asking each other, ‘who are those people?! Are all Icelanders as crazy as them? !” Again, another big laugh from them all! Isn’t it informative to us all that people from a completely different culture and language could have so much in common with us? Their sense of family, friends, their work and their ability to enjoy the fruits of their labor through a wonderful Holiday far from home. I know that not everyone can be blessed with the opportunity to travel abroad for leisure. I do know that those who can are so very fortunate. I never lose site of how fortunate Nancy and I are that we can take part in such adventures. We arrived in London Heathrow nearly 6 hours later than scheduled but were greeted by our very dear and close friends, Carl and Marion. This will be the fifth “epic” Holiday that we’ve shared together. We safely arrived in their home near Portsmouth, England in which they treated us to a lovely dinner. This morning they made us a “proper” English breakfast which was both delicious and very filling. We repacked our bags and off we went for a five day trip to Wales. 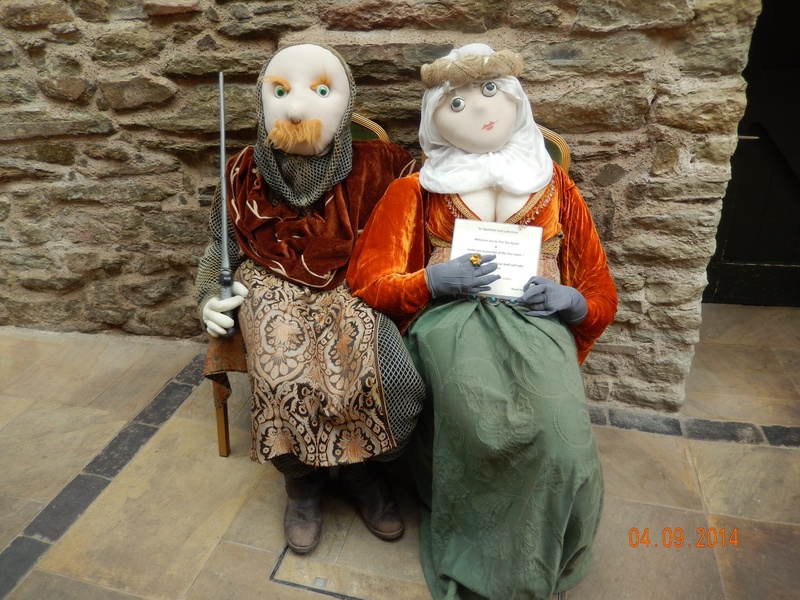 About half way there we stopped in the medieval town of Ludlow near the English-Welsh border. 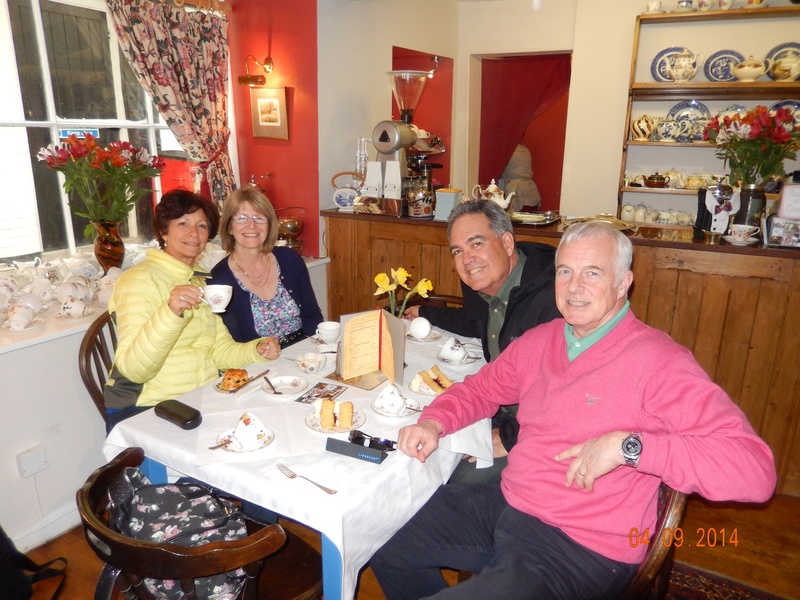 We walked around the very pretty town and stopped at a “proper” tea house for our afternoon tea and cakes. The tea was excellent. Carl and I had a Victorian sandwich while Nancy and Marion enjoyed scones with clotted cream and jam. 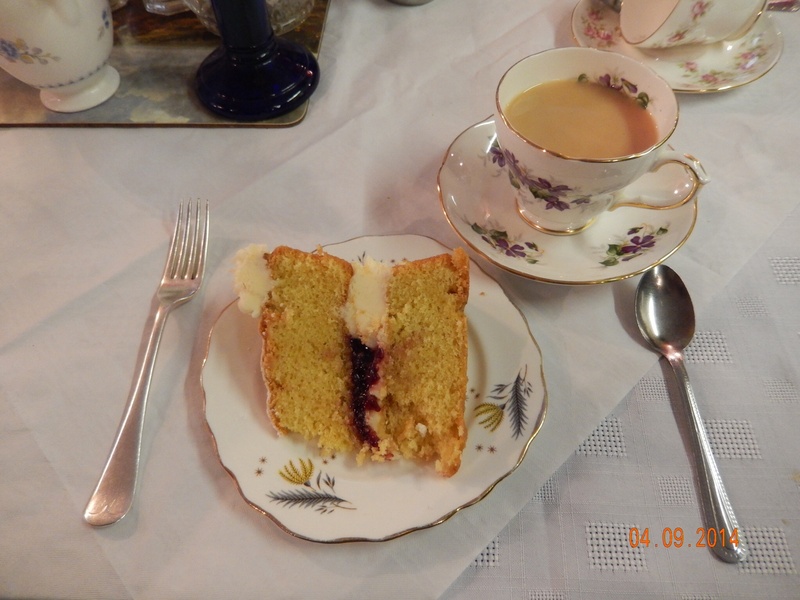 The Victorian sandwich is not a sandwich but a sponge cake with a butter cream filling with raspberry jam and butter cream icing. Delicious! This is the first time Nancy and I have ever visited Wales. The Welsh countryside is beautiful with countless rolling hills and valleys in rich greens and sheep scenically dotting the rural countryside. Once in Wales all the street signs are both in English and the native Welsh language. Like the Icelandic language I mentioned earlier, I cannot make out a single word! We arrived at our destination at about 7pm in a beautiful bed and breakfast called the Glyntwrog House outside the lovely village of Betws-y-Coed. We have a lot of adventures planned for the week in which I will be happy to share with you. Unfortunately, for now, I don’t have the right interface cable to download my pictures to my iPad Mini for this blog. Therefore, I must apologize for not having any pictures to share with you at this time. I will remedy that in the next day or so. 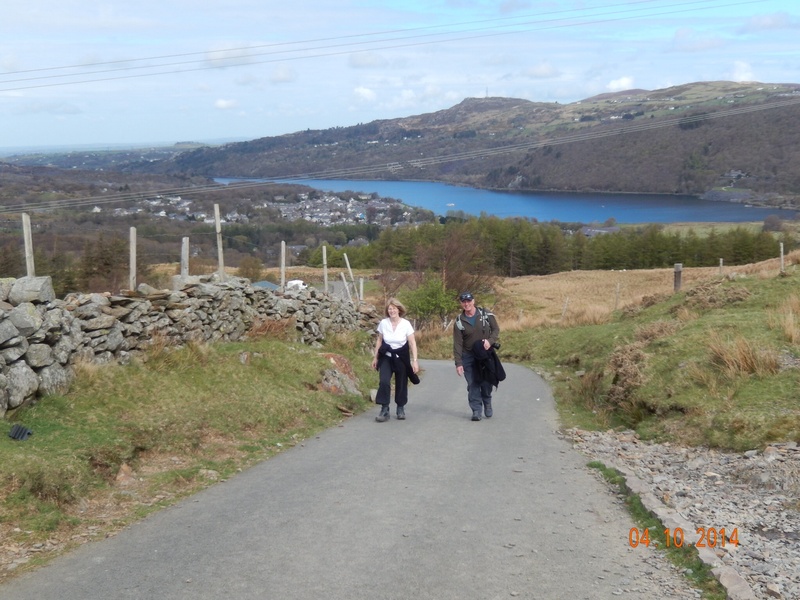 On to hiking in the region of Snowdonia! 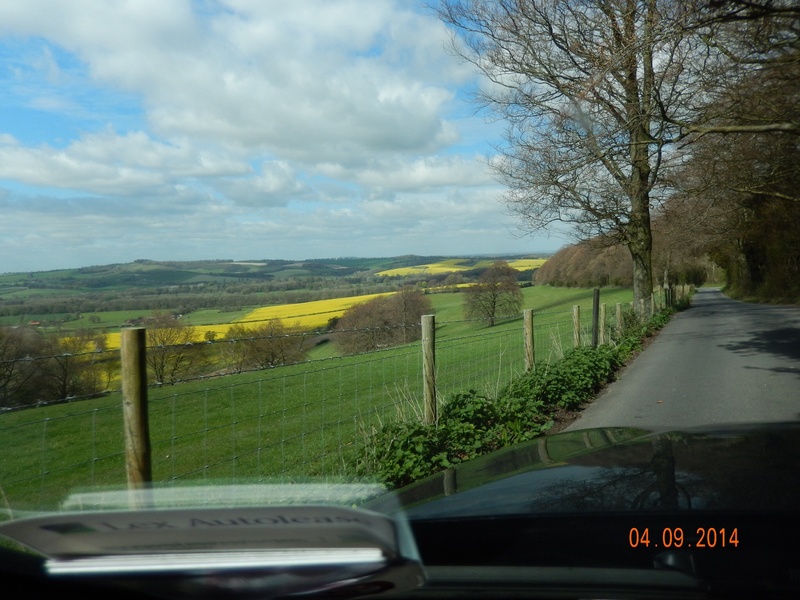 Lovely English countryside outside Portsmouth. 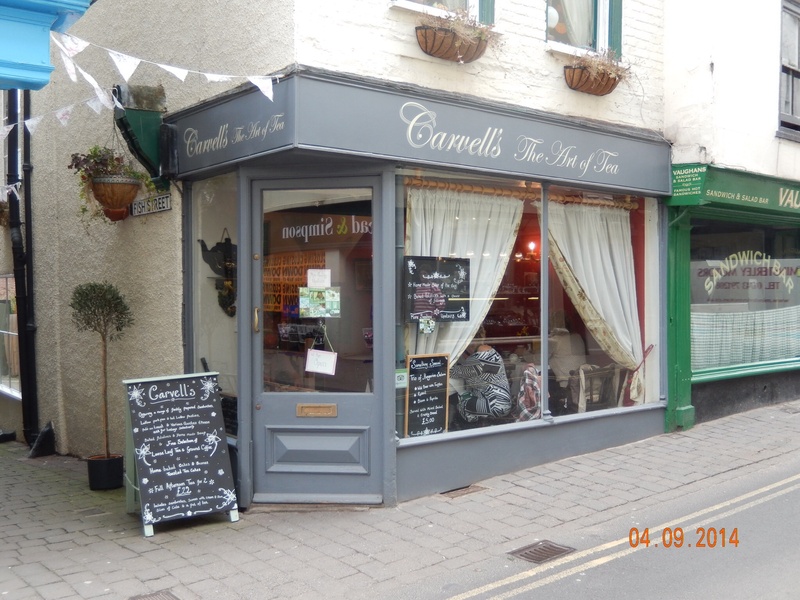 Carvell’s Art of Tea Shop in Ludlow. 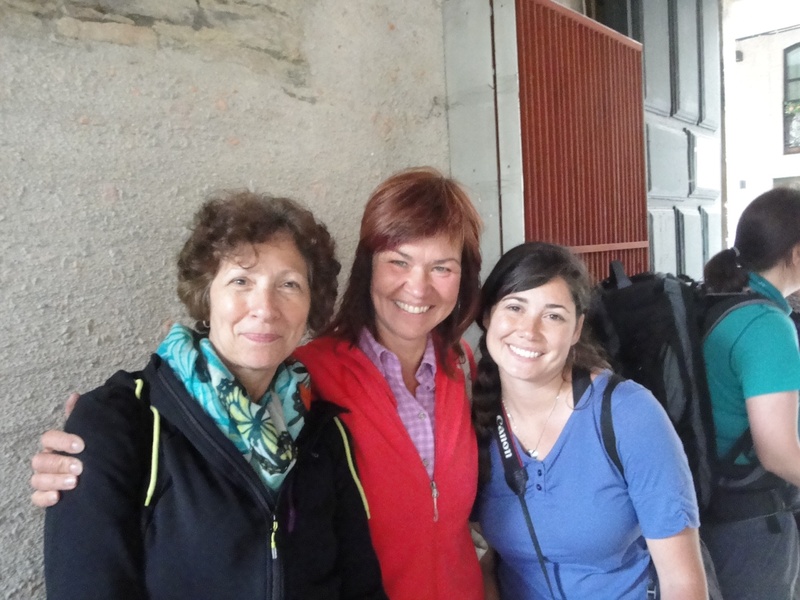 It has been nearly a year since my wife, Nancy, daughter, Andrea, and I began our Camino de Santiago pilgrimage in northern Spain. The experience of backpacking nearly 500 kilometers from Burgos, Spain to Santiago de Campostela has left an indelible mark on my soul. There are so many thoughts and personal insights that I would like to share. Nancy and I are returning to Europe for primarily to attend the wedding of a dear friend’s son. However, last year’s Camino experience has changed not only the way I view travel but the way I view the world. In the coming weeks I will share my humble observations. We will arrive in England and stay with our dear friends in their home for just one day before we travel to northern Wales for five days. 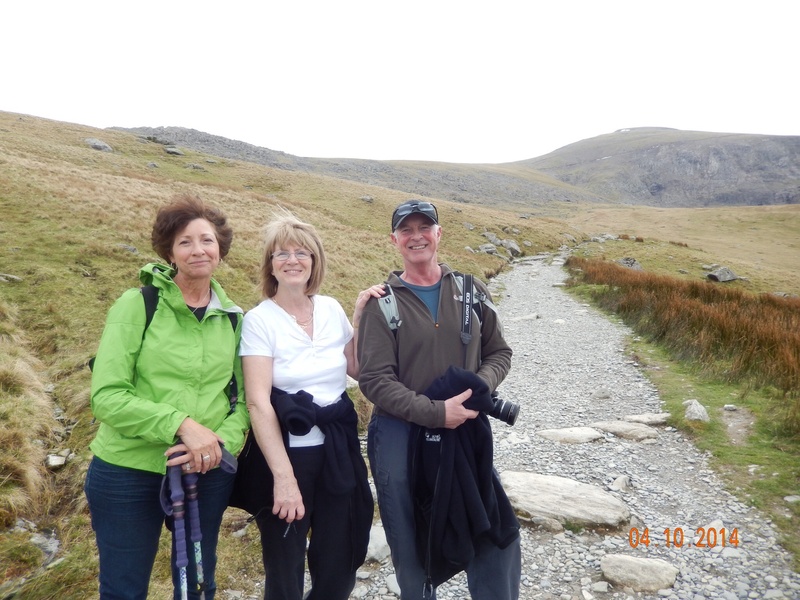 We’ll be in rural Wales and plan to hike in a national forest and climb to the summit of Mount Snowden. The United Kingdoms’s second tallest mountain. From Wales we’ll stay in Stratford upon Avon. The little English town William Shakespeare made famous. After Stratford it will be off to Portsmouth, England for the wedding. There will be festivities for four straight days! I hope to survive that! After recuperating we plan to attend Easter Mass in a local church. The following day we leave for Cologne, Germany where we will meet our Camino sister, Heike whom I spoke of extensively during our Camino in Spain. 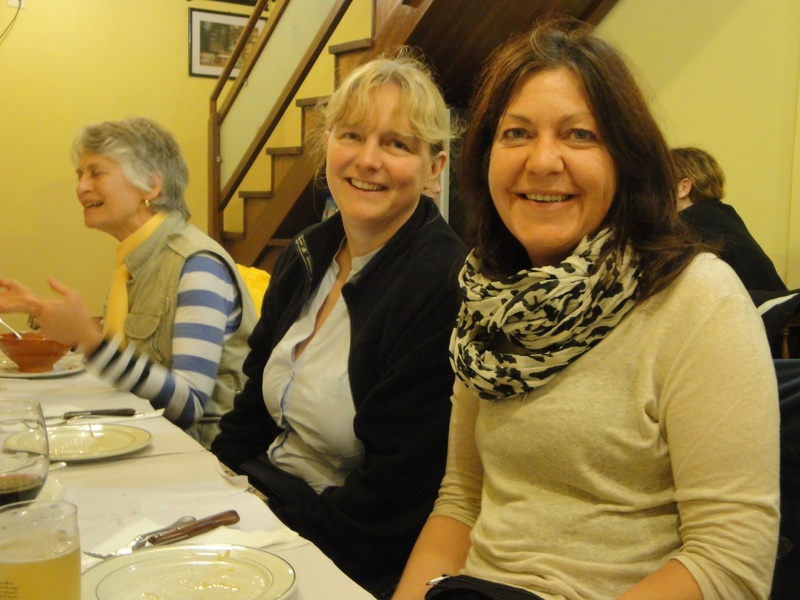 Heike joined Nancy, Andrea, and I while walking the Camino, ended up walking the entire Camino with us, and as a result have become life-long friends. She is one of our greatest gifts of walking the Camino in Spain. To keep our Camino experience fresh, Heike, Nancy and I will backpack about 100 kilometers from Cologne to Heike’s home town of Aachen. The path we will take is part of the Camino de Santiago that is in Germany! In Germany the Camino is known as Jakobsweg. We’ll visit Aachen with Heikemas our fabulous tour guide. We will also travel, by vehicle ;o), to the village of Altlay where Nancy and I lived from 1979 to 1981 when I was serving in the US Air Force. Heike made reservations at the same Gasthaus Nancy and I stayed when we arrived as newly weds. We even know the owner’s of the Gasthaus! We will return to Colorado from Brussels, Belgium. The Spanish people as a whole have been suffering from a very weak economy and an unemployment rate that went over 27% earlier this year. The unemployment rate for those less than 25 years of age was at 56.5% at the end of May 2013. The people I saw begging in the streets were nearly always people who looked truly destitute. They wore dirty clothes, their hair unkempt, and their bodies in need of a major washing. Their demeanor was also very humble and passive. Typically, they were kneeling on the ground with head down and hands out. Sometimes a sign written in Spanish explained their need and solicitation for help. Walking into the magnificent Cathedrals in Burgos, León and Santiago de Compostela, there were beggars at the entrance ways. My sense is that most of these beggars’ plight was sealed well before unemployment dramatically rose in Spain. There were other beggars that were not as passive and would come to your table at a sidewalk café or in the train showing faded pictures of their children asking for money to help keep them fed. I spoke to many of the owners who ran the family owned Hostels and Hotels catering to Pilgrims as well as to employees at some of these same establishments complimenting them on how hard they work for so many hours each day. In nearly every case, they responded very humbly and graciously stating that they were grateful to have work, given how many of their fellow Spaniards were out of work. I share this with you because as tough as the economy is in Spain and the future not looking very rosy for their youth, violent crime is very low in Spain. Physical harm towards tourists and especially Pilgrims along the Camino is unheard of. I’m not saying that it has never happened. What I’m saying is that it is extremely rare. 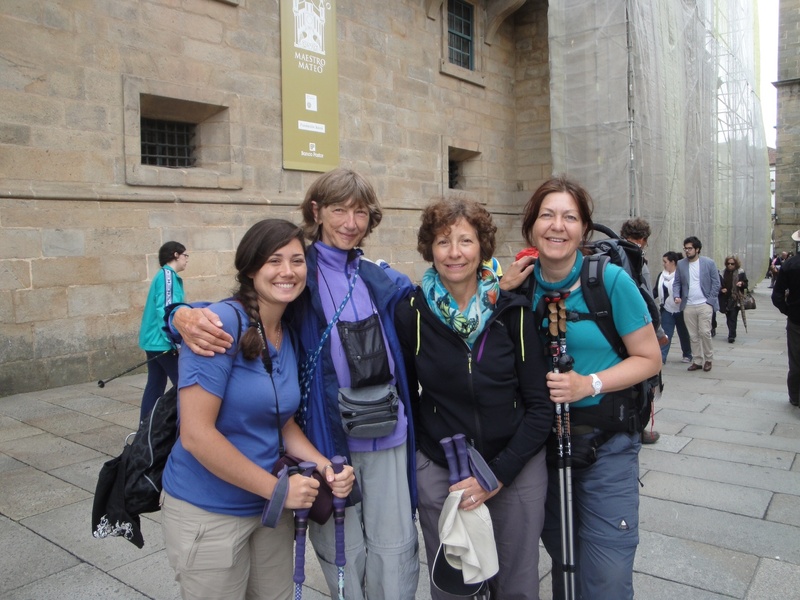 I was very surprised to see how many women, of all ages, are walking the Camino – alone. They may end up partnering with a few other pilgrims along the way, but it is common to see women walking alone on the Camino in the middle of nowhere. At no time during my entire stay in Spain which includes the Camino, Barcelona and Madrid, did I ever feel unsafe. Particularly while walking the Camino. I never felt any danger (from a Dad’s or Husband’s perspective) for my wife or daughter if they walked ahead of me out of sight or I ahead of them. I also did not hear of a single incident in which a female or male pilgrim felt that they were being threatened by anyone on the Camino. I also saw countless dogs on the loose along the Camino. I don’t think they were wild dogs. They were domestic dogs belonging to someone in the village and were allowed to roam around as they pleased. Not once did any of these dogs growled at me or acted in a menacing manner. There were even a few very healthy looking German Shepherds sitting at the entrance to their master’s homes but they too didn’t challenge my presence as I walked along, making no eye contact, or walking toward them or their territory. I just kept moving! Maybe there is some common sense that needs to be used regarding any dogs you encounter along the Camino. I didn’t approach any of them nor did I make eye contact with them. The only exceptions were a few friendly smaller dogs approaching me wagging their tails and showing no signs of aggression. Every dog I saw that was barking at the Pilgrims was behind fences or leashed. Maybe it’s a false sense of security but I felt that my trekking poles would provide me a safe distance from any menacing dog that wanted to get too close to me. I wouldn’t worry too much about the dogs. The biggest threat to security while on the Camino would be pickpockets and theft of your backpack. This is where common sense and awareness of your surroundings really come into play. Although there is literally a sweet spirit on the Camino and there is little to no danger of being robbed by your fellow pilgrims or the villagers whose livelihood is dependent on the Pilgrims, you will walk through some large cities and towns which will require vigilance. I would recommend that you be aware of these crimes but to not allow it to dominate your thoughts and dampen your experience of the Camino. We kept our money, passport and Credencial del Peregrino (your Pilgrim’s “passport”) in an RFID money belt with the strap around our necks and the money belt in our front underneath our clothes. This definitely makes it harder for a pickpocket to take your money belt. The reason I used an RFID money belt is because they have a special liner that helps block unauthorized scanning of the Radio Frequency Identification (RFID) chips inside passports, credit and debit cards. That has been a security issue in recent years in Europe. You’ll likely be staying overnight and/or walking through some large cities and towns along the Camino such as Pamplona, Burgos, León, Ponferrada and of course, Santiago de Compostela. In these larger cities, like any larger city in the world, don’t leave anything valuable lying around. Don’t ever leave your purse or backpack on the back of a chair or even laying it by your feet. In tourist areas in any of these places, don’t make it easy for thieves to do a “grab and run.” My wife and daughter did not bring a purse to Spain and I did not bring my wallet. The money belts we used contained our passports, cash and credit/debit cards. It was all we needed. We also had a color copy of our passports in our backpacks so that if our passport was stolen, we could use our copy of our passport at the US Embassy or Consulate to expedite getting a new passport. When I sat at a café, train or bus station, I sat down with the straps to my backpack through my leg so that if someone were to try a grab and run, they’d have to take me with them! When we were at Alberques in which there are no private showers, I kept my wife and daughter’s money belts while they bathed, then they kept my money belt when I bathed. You don’t have to worry about the “real” pilgrims along the Camino. However, there are thieves who masquerade as pilgrims. This is especially true the closer you get to Santiago. These thieves look like Pilgrims and hike along the Camino. When they check into an Alberque they then prey on the trusting pilgrims in the Alberque. This happened to a South Korean pilgrim. She checked into a large Alberque in the village of O’ Cebreiro just a few kilometers into Galicia from the Castile y León border. When she went to take her shower, a thief walked off with her unattended money belt. That individual walked away with this young woman’s passport, credit card and €2,500! That leads me to the next observation – don’t carry around that much money! There are plenty of ATM’s along the way. Although most of the businesses along the Camino operate on a cash only basis, you don’t ever need to carry around that much money. I traveled with my wife and daughter; therefore, I was paying three times as much for everything. However, I never had more than €400 in my money belt at any given time. If I was traveling alone along the Camino, €100 to €150 would have been more than enough at any given time. If she had no Camino friends she could have trusted with her money belt (unlikely by the time you reach O’ Cebreiro but possible) she could have spoken to the people running the Alberque to secure her money belt while bathing. If you’re on the Camino with your spouse, significant other, family member or friend, just watch each other’s back. Remain cognizant of your surroundings when using an ATM, don’t flash big wads of Euros in the café, hotel, restaurant, train or subway station. 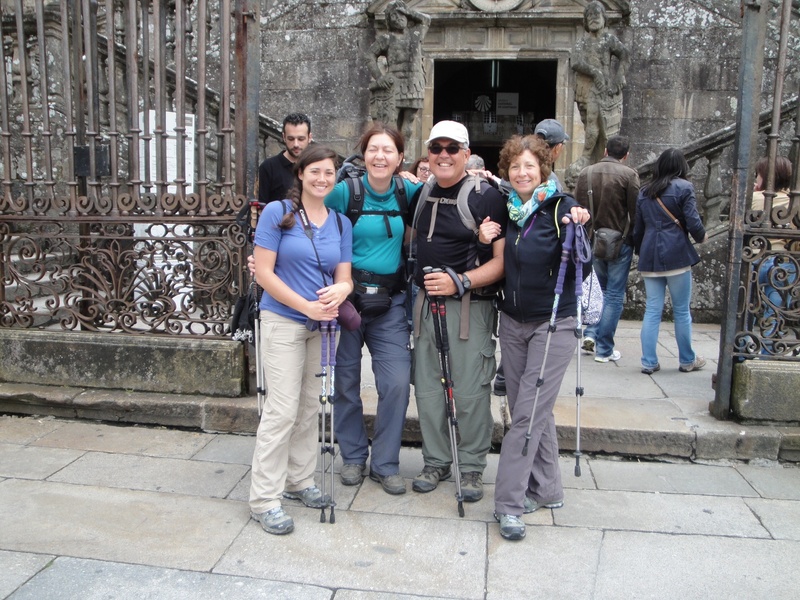 Ladies, I wouldn’t bring any valuable jewelry on the Camino, including your wedding band. Do you really need jewelry on the Camino? 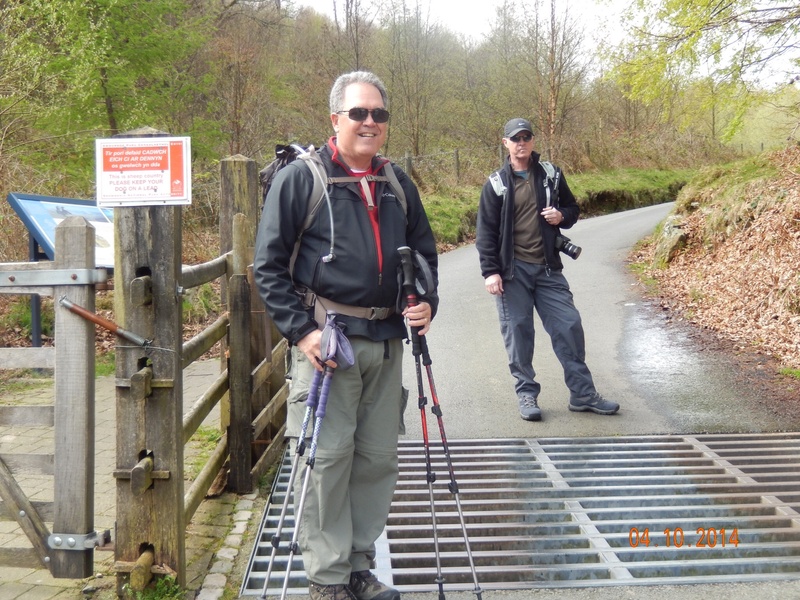 Common sense goes a long way regarding security on the Camino and touring Spain in general. Being reasonably cognizant of your valuables and your surroundings should mitigate the risk of losing your valuables. I’ll close with a full disclosure statement. Nancy, Andrea and I were in Spain for 5 weeks. We flew into Madrid, took the train from Madrid to Burgos, walked the Camino from Burgos to Santiago (with a small use of taxi, bus, and train mentioned in previous blogs), took the train from Santiago to Barcelona, then a train from Barcelona to Madrid. 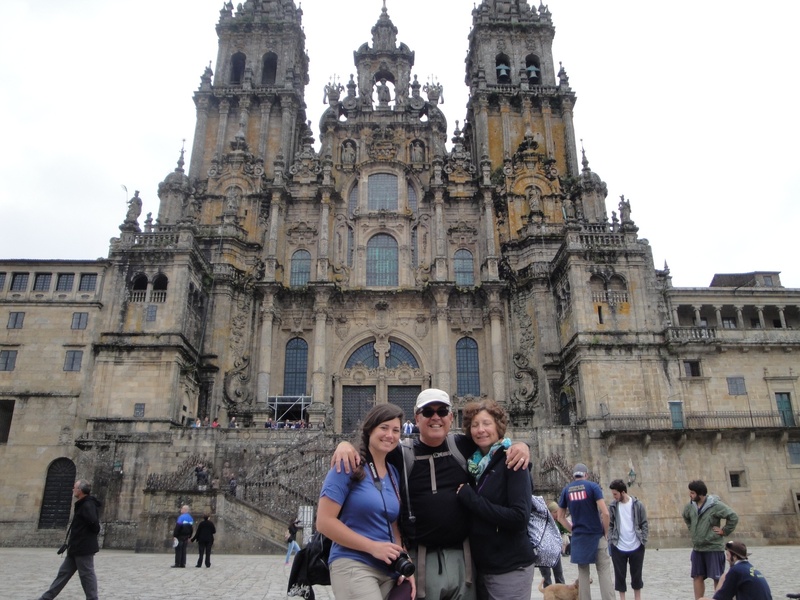 We did major sightseeing in Burgos, León, Astorga, Ponferrada, Santiago de Compostela, Barcelona and Madrid. I carried valuables such as my camera and iPad Mini (used for making posts onto this website), while my daughter carried her expensive camera and iPhone. Thirty six days in Spain. We did not lose a single item – until the late afternoon of day thirty five. We were enjoying an afternoon meal at a really nice sidewalk café on the scenic Plaza de Neptuno in Madrid. Two “beggars” broke our tranquil setting of Sangria fueled easy conversations regarding our wonderful experiences on the Camino, Barcelona and Madrid. A laminated sheet of paper with a solicitation for money written in Spanish was slammed on our table by a handsome, athletic and well-dressed man. He was looking at Andrea asking for money. His sidekick who looked like him standing to the side was looking at Nancy and me. Their approach was sudden and out of nowhere. They didn’t fit the demeanor of all the previous beggars I saw in Spain. Something was askew and I didn’t like it. I told him in Spanish that we are sorry but that we did not have money for him. He looked at me with no remorse or humility and indignantly asked me for money. I said “no!” His sidekick started cursing at me in Spanish and they were gone as quickly as they came. Nancy, Andrea and I looked at each other with astonished faces asking what had just happened. We left just a few minutes after that. It was then that Andrea noticed that her iPhone was gone. Since returning to Colorado, anyone who asks how was my Camino will find that I’m still very energized and passionate about my experiences on the Camino. As meaningful as the Camino was for me, I needed some time to process what I had experienced. My sense is that I will continue “processing” my experiences for an undefined period. However, I’ve been feeling a strong urge to start a series of posts sharing some of my reflections. I’d like to start with our actual itinerary. We started off with the strategy of starting slowly and giving us an opportunity to develop our trekking legs. Since we started our Camino in Burgos, which is the largest city on the Camino Francés, we anticipated a lot of pilgrims leaving Burgos the same day as us. Since nearly all the English speaking pilgrims were using the John Brierly Pilgrim’s Guide, my assumption was that many of those same pilgrims would be following Mr. Brierly’s recommended daily stages for each day. That immediately put us in the rural Spanish Meseta with very small villages offering accommodations. Therefore, I took the advice of a “veteran” pilgrim who started in St. Jean Pied du Port and looked at starting our Camino out of Burgos very slowly and staying away from the recommended stages which might heighten our probability of accommodations. I believed this strategy helped us along the way. To be fair, I’ll never know. Once our actual hiking on the Camino started, I also quickly realized that we needed to be open to what the Camino brought us which included being sensible about public transportation, if needed. 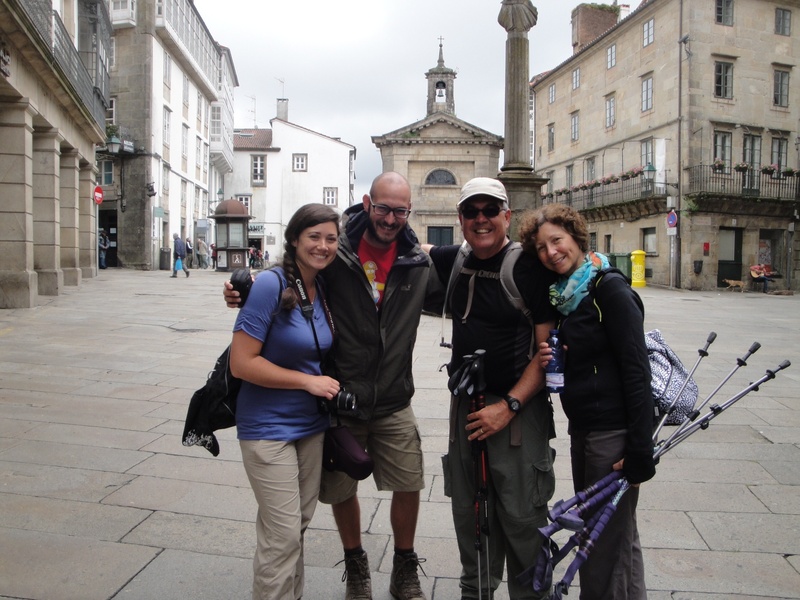 Therefore, along the way, when we felt it was necessary we at times took a taxi, bus, or train to ensure that we would reach Santiago de Compostela in a relatively healthy state and to have walked at least the last 100 kms to receive our Compostela. Below is our day by day itinerary. My distances are based on those provided in John Brierly’s “A Pilgrim’s Guide to the Camino de Santiago.” They are approximations. The format is basically each day’s “stage”, approximate distance walked and where we stayed that evening. I also indicate when, where, and why we took public transportation. Also, please note that when we reached each day’s destination, we walked everywhere. Therefore, we walked for sightseeing, finding restaurants, or looking for a good wifi connection. The total distance walked for all of us is more than just the hiking distances shown below. it is from Terradillos de los Templarios that Nancy and Andrea took a Taxi to Sahagún and then a train from Sahagún to Leon. Nancy’s knee was really bothering her and Andrea’s hips were tightening up. Since it would be a three day hike to Leon from Terradillos de los Templarios, we thought that would give Nancy and Andrea additional, much needed rest. Heike and I continued hiking. 9 consecutive days of walking for total of 173.2 kms / 107.4 miles, averaging approximately 19.2 kms / 12 miles per day. After Heike and I inadvertently walked 40 kms (we got lost!) we were wiped out. In Brierly’s guidebook, he also recommends not hiking into Leon because of the heavy traffic getting through the industrial part of the city. Therefore, we took a taxi to LEÓN from Mansilla de las Mulas saving us 18.6 kms / 11.5 miles of walking. Heike and I really needed that! 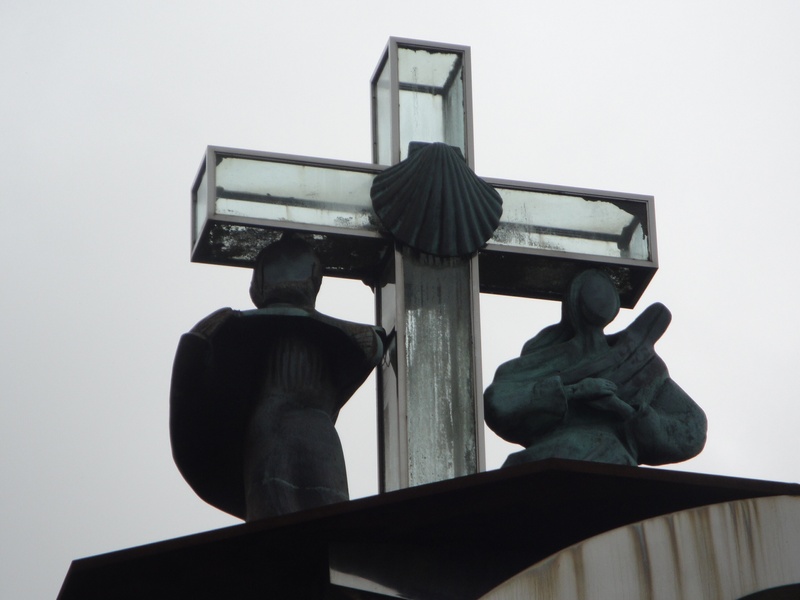 Monday, May 27 took bus from Leon to La Virgen del Camino for 8.5 kms / 5.2 miles. Again, we followed Brierly’s advice regarding getting out of Leon’s industrial area. We made up for that by walking a solid day. Saturday, June 1 – Took bus from Ponferrada to Villafranca del Bierzo for 24.4 kms / 15 miles. Again, as a team, we discussed this and listening to our bodies, we took the bus to save our legs for the upcoming mountain climb into Galicia. 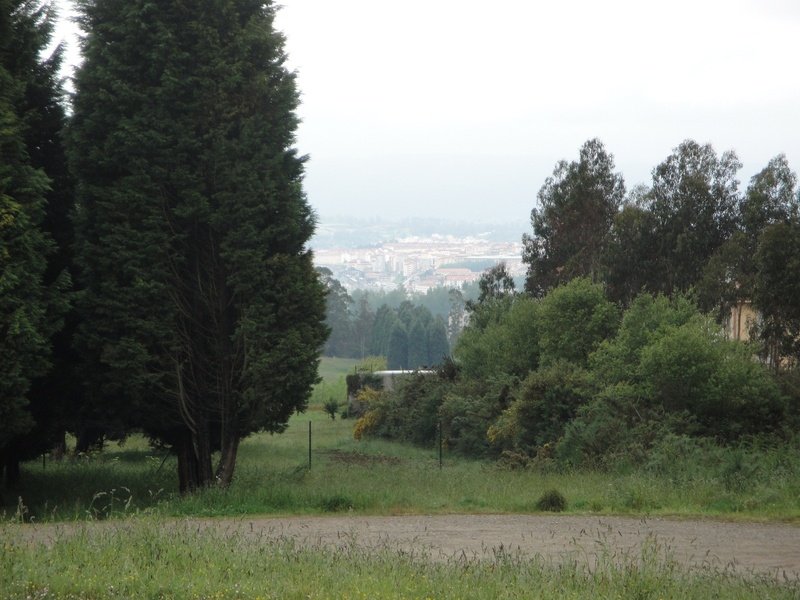 Monday, June 3 – Fonfría to Triacastela for 9.0 kms / 5.6 miles. The previous day was truly grueling in that we climbed the very steep path to O’Cebreiro and onto Alto do Poio. Therefore, we made this a very short day to Triacastela to recover. for a total of 271.2 kms / 168 miles which is an average of approximately 20.9 kms / 13 miles per day. Each of us who have walked the Camino and for those who plan to, I believe we must find our own way to completing our pilgrimage to Santiago. For those of you who have or will walk further, bravo! For those who have or will walk less, bravo! Exhausted and very calmly taking in the euphoria of being on the Praza Obradoiro this past Sunday afternoon after our 24 day walk, we saw our Danish Camino friends Henrik and Heide who started their Camino from their French home more than 1,200 kilometers away. 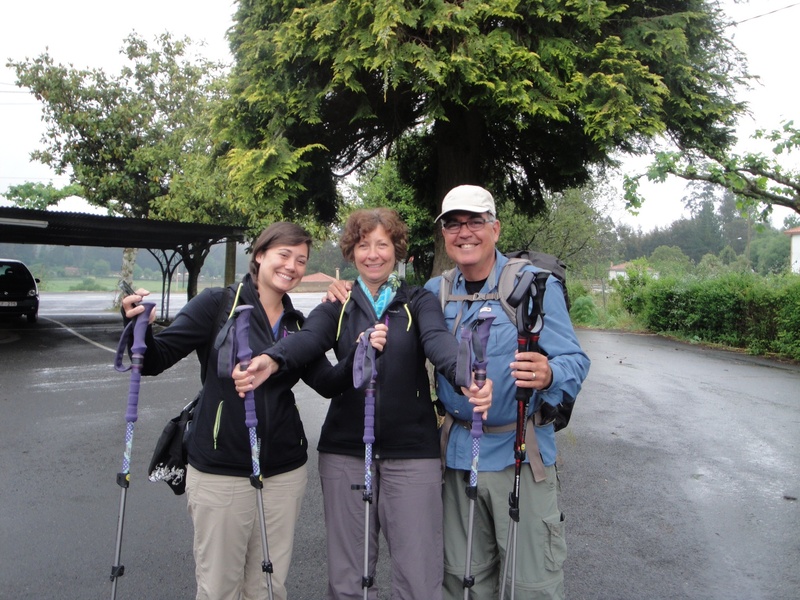 They started their Camino on April 6 and arrived in Santiago on June 8, the day before we did. We asked if they had attended the Pilgrim’s Mass held at the Cathedral everyday at noon. Henrik shared with us the unexpected pouring of emotions when he and Heide first entered the plaza in front of the Cathedral. It was a surprise to both of them. After a days rest, they looked surprisingly refreshed. They are a very handsome and friendly couple. Heide was celebrating her birthday on Monday, June 10. Heide recommended that if we go to the Pilgrim’s Mass to not sit facing the Altar but to sit on either side of the Altar so that we would have a better view of the Botafumeiro if it was to be used during the Mass. The floor plan of the pews in many Catholic Churches are shaped like a cross if one were looking down. Therefore, the preferred seating would be on the “arms” of the cross. That would make sense because the Botafumeiro is swung “sideways” running perpendicular to the altar. Nancy, Heike, Andrea and I all agreed to meet at the front of the Cathedral at 1045 Monday morning for the noon Mass. We entered the Cathedral and looked for a pew. Although it was about 1050 when we sat down, the pews were already filling up. As it turned out, we could not have picked a better place to sit. We had an unobstructed view of the Altar and Botafumeiro. The Botafumeiro is likely the largest Thurible in the world. The Thurible is the incense burner hung from chains in which the priest will use during the Mass to dispense the incense around the Altar. 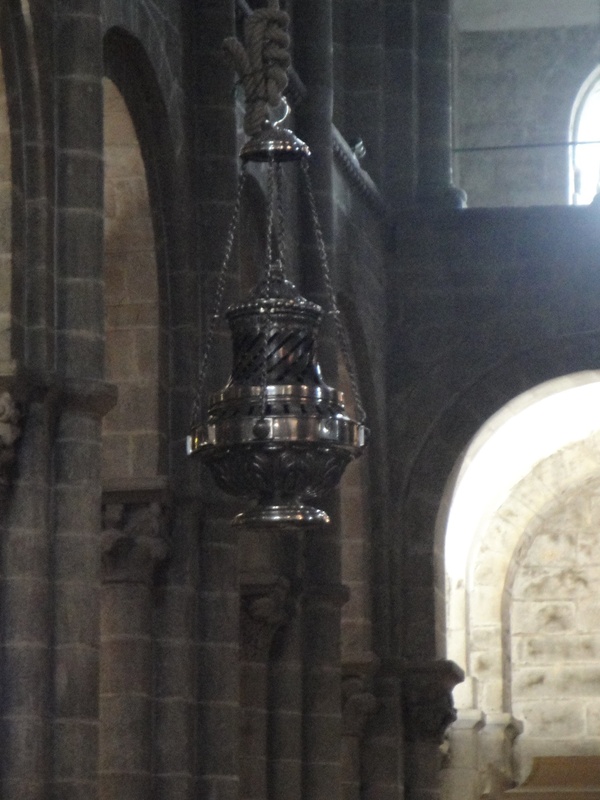 We’ve heard that this massive Thurible the “Botafumeiro” was originally used as a fumigation of the many sweaty, stinking, and in some cases, disease-ridden pilgrims attending this Mass. Hopefully, that is no longer the case for the pilgrims present at this Mass. The first pew that was available to us allowed a very memorable view of the Altar and Botafumeiro in front of us and the statue of St. James, the Moorslayer, to our right. With the more than hour wait before the start of the Mass, we all had a very good opportunity to pray, reflect, and soak in the sights and sounds of the Cathedral. For me, it was a wonderfully spiritual way to prepare myself for the Mass. As people started to find the remaining seats, I saw Marc, from Barcelona approach. Marc was the pilgrim we met about a week ago as we entered Galicia. He had twisted his ankle badly climbing up the mountain to O’ Cebreiro and was hobbling painfully for days. Everytime I saw him I asked him about his feet and ankle. Each time I saw him he thanked me for asking and responded that his ankle was getting better. The last time I saw him a few days ago, he said that he would crawl to Santiago if he had to. He made it! The pews were starting to fill but there was space for Marc in the pew behind us. A French woman, on her third Camino filled the remaining space on our pew and sat next to me. Her first pilgrimage to Santiago was 35 years ago with her parents. The drove the Camino Frances by car but did attend the Pilgrim’s Mass. She said there were far less pilgrims then than now. The Cathedral continued to fill with people from all over the world. Gabby, our Camino friend from Germany who we walked with for several days and shared a few meals with approached our pew with a big smile. We all hugged and kissed her. There was one remaining space in the pew behind us next to Marc. No surprise, right?!?! 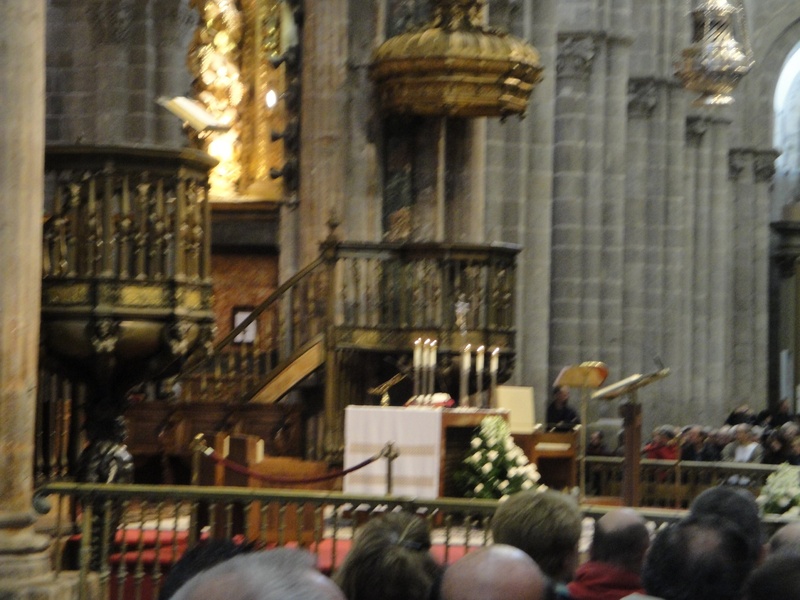 A Spanish woman working at the Cathedral made an announcement stating that pictures can only be taken without a flash. This has been standard at all the Cathedrals and churches we’ve visited. She also stated that during the Mass, no pictures or videos at all are to be taken. She also said that since this was a Mass, all visitors were asked to leave the Cathedral so that those who were there to worship could do so reverently. She then made this same statement in French, Italian, German, English, Portoguese, Galician and a few other languages I didn’t recognize. In other words, she made it clear regarding her requests regarding photos, videos, and visitors. A nun came to the Lectern by the Altar and sang for us the Responsorial Hymns we were to sing during the Mass. She had a very gentle, angelic voice. Very appropriate for this venue. Soon the Mass started. The Homily (Sermon) given by the Celebrant (Priest) was very warm and welcoming. This Cathedral can hold 1,000 worshipers for Mass. The Cathedral was packed with standing room only. This is a very large Cathedral but one has the sense of coziness and closeness to one another in this Sanctuary. Although the entire Mass was conducted in Spanish and a little Latin, I understood most of it. 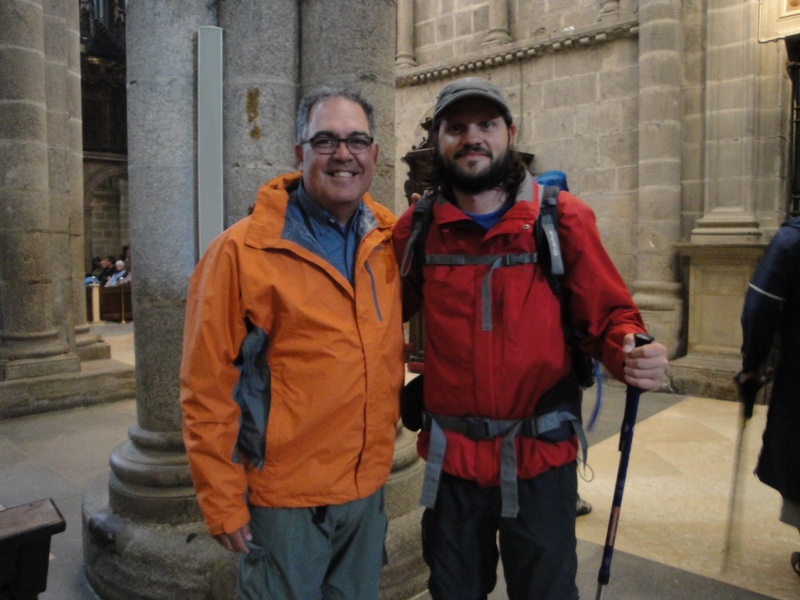 His Homily was tied in with the Spirit of the Camino and how the Pilgrims carry that spirit in friendship and openness for one another when walking the Camino. He talked about the importance of each of us to continue to treat one another with this same positive approach when we go out into the World. It was a very uplifting and welcoming sermon. I believe it was the perfect message for our pilgrimage to Santiago. We received Holy Communion which was one of the most meaningful I’ve ever experienced. In this place, in this house of St. James. After Communion was given, about 8 men in maroon robes approached the Altar and started clearing a path for the Botafumeiro. These men are tiraboleiros who handle the Botafumeiro and massive rope holding and controlling the Botafumeiro. They lit the incense inside this giant Thurible and then started the swing the Botafumeiro. Slowly, methodically they swang the object both side by side and up and down, just as a Priest would with a miniature version, Then the Botafumeiro started to gain momentum swinging side by side with an ever increasing arc. I chose to honor the request of no photos or video of the Mass. Although that request was clearly made in enough languages that everyone should have known, disappointingly, a very large number of people chose to ignore or defy the request. Throughout the Mass people were taking photos (with flash) and videos. When the Botafumeiro started to swing, to many people to count started flashing and videoing away. I was personally disappointed at their lack of respect for what was a very personal gift of this special and meaningful Mass. However, it was an incredible sight seeing the Botafumeiro reach the maximum length of its arc, the height it reached at each end of its swing, the speed it attained and the total control of the Botafumeiro the tiraboleiros held. It is a visual, emotion, and memory I’ll carry the rest of my life. As the Botafumeiro majestically slowed to a reverent stop, still bombarded with flashes and videos, many of these same people started applauding and whistling like they just saw a show. Maybe it’s me and I’m “old fashioned” when it comes to being reverent in Mass and simply in awe of what I just witnessed and experienced, I prayed for better understanding as to why I was disappointed at those who had complete disregard for the clear instructions at the beginning of the Mass. I’ll need more discernment on that topic and try to learn what lesson is there for me to learn from. I will post pictures of some of the Camino friends we saw Sunday afternoon and Monday after the Pilgrims Mass. I plan to make several more posts in the coming days and weeks too share some of my reflections but also to share some of my experiences which might be of some use for fellow pilgrims planning to start their own Camino in the coming year. Nancy and I will be happy to make ourselves available to provide our insights or answer specific questions you may have regarding your upcoming Camino. This much I do believe, the Camino experience has been too rich and deep for me to process so quickly after reaching Santiago. It may take me days, months, or even years before I realize the full impact of this journey. This much I also believe, my “Camino” doesn’t end at Santiago de Compostela in northwest Spain. I suspect my “Camino” and the Spirit of the Camino continues and will continue to give back to me for the rest of my life. Buen Camino! Volker, the handsome police officer from near Osnabrueck and Renate the pretty, shy young lady from near Munich who were so kind to Heike and I after our 40 kilometer walk to Reliegos. They reminded me of what is so good about Germany – it’s people. Natasha with Heike in line to receive our Compostela. Natasha is in the German Army (prettiest soldier I ever saw!) and another one of those angels who welcomed us at Reliegos. She was leaving the next day to continue walking to Finisterre. Champions League, Natasha! Jana, from the former East Germany who was walking at about the same pace as us as we kept running into each other for the last 300 or so kilometers. Our Canadian Camino friends who we kept running into along the way. Wayne, I’ll be watching your Maple Leafs next year! Gabby with Heike and the rest of the Gomez-Ortmanns-Sanchez crew at dinner last night. Gabby is a very friendly lady with a lovely family back home. We hope to see her again. Marc, the young man from Barcelona who literally hobbled and limped his way to Santiago. Mila, the very pretty, young Spaniard from Madrid who we all met and shared dinner with at the Casa Milia. 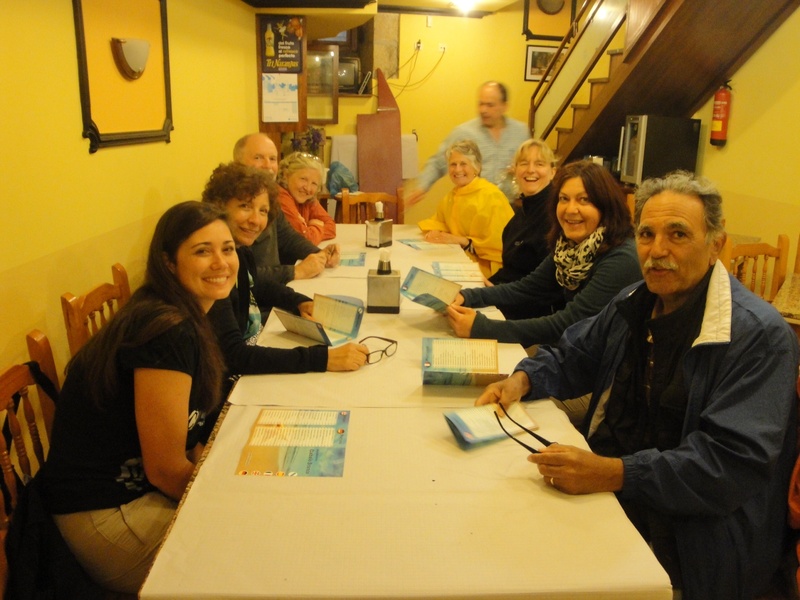 Dinner last night with our uncle and aunt – Adel and Janice along with our new found Camino friends, Charlie and Paula and our “old” Camino friends Heike and Gabby. 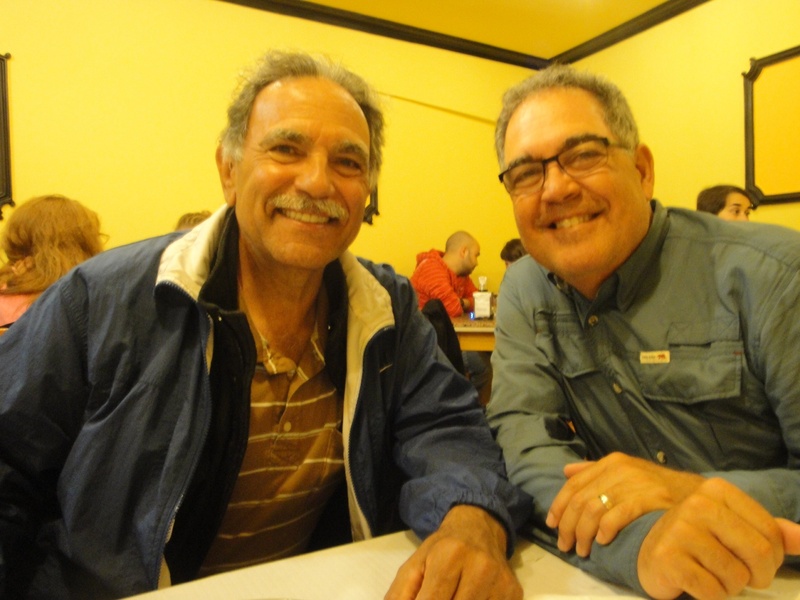 My beloved Uncle Adel, my tio, who I have literally met in places as far apart as Heidelberg, Germany, Seoul, South Korea and now, Santiago de Compostela! 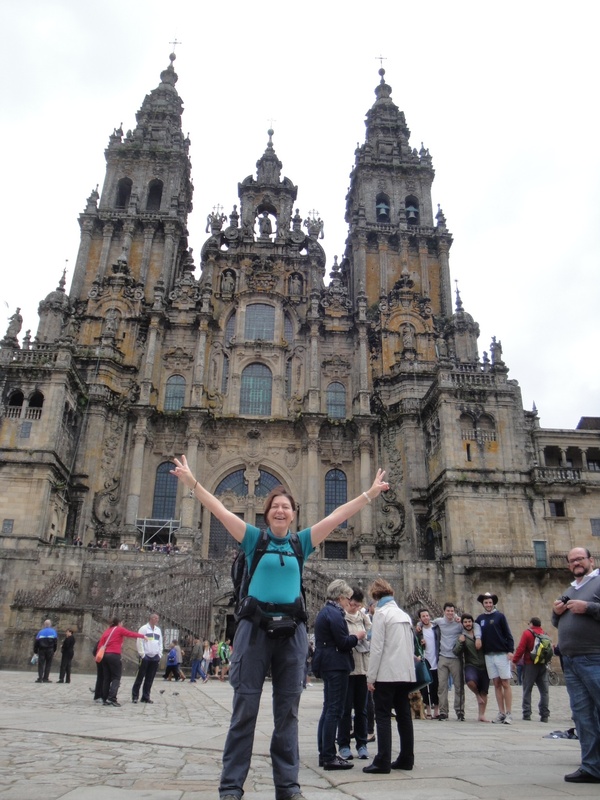 Britta, from Denmark, completing her third Camino! We met her in Leon and have been Camino friends since. The famous Botafumeiro in the Santiago Cathedral. St. James, the Moorslayer, in the Cathedral, also known as St. James the Pilgrim. 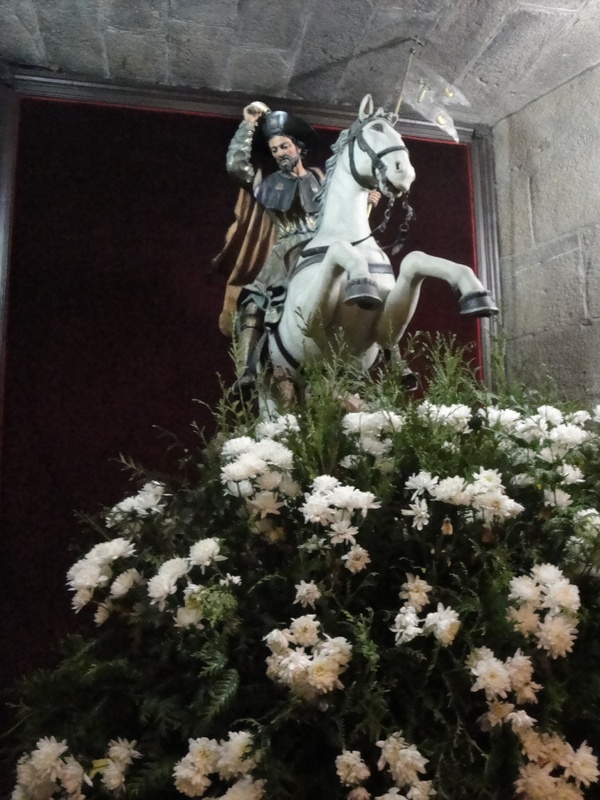 The Altar at the Santiago Cathedral before the Pilgrim’s Mass on Monday, June 10. Typical scene at the Plaza in front of the Santiago Cathedral. Pilgrims from all over the world. 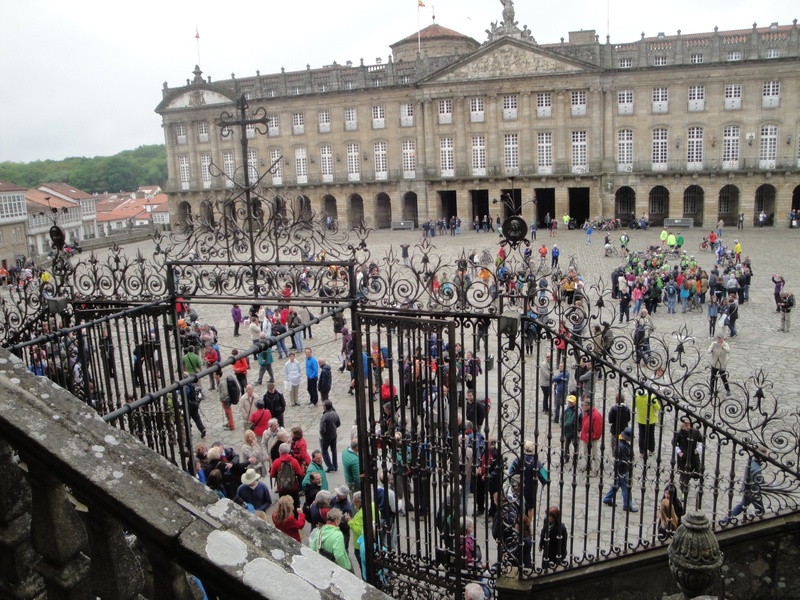 Day 24 – Santiago de Compostela!! Yesterday morning in the little village of A Rua started slowly for me. We were about 22 kilometers outside Santiago so it would be our last day of walking. For the last few days, I woke up with my feet still aching and painful when I put weight on it. The skin on the bottom of my left little toe had the skin worn off it. Heike had a good ointment to put on open sores and Nancy expertly fashioned a moleskin bandage to wrap my toe. It made it more bearable to walk. Nancy, Andrea and Heike had already gone downstairs to eat breakfast. I got all my gear, looked at the room for the last time in an attempt to take in our last morning on the Camino. 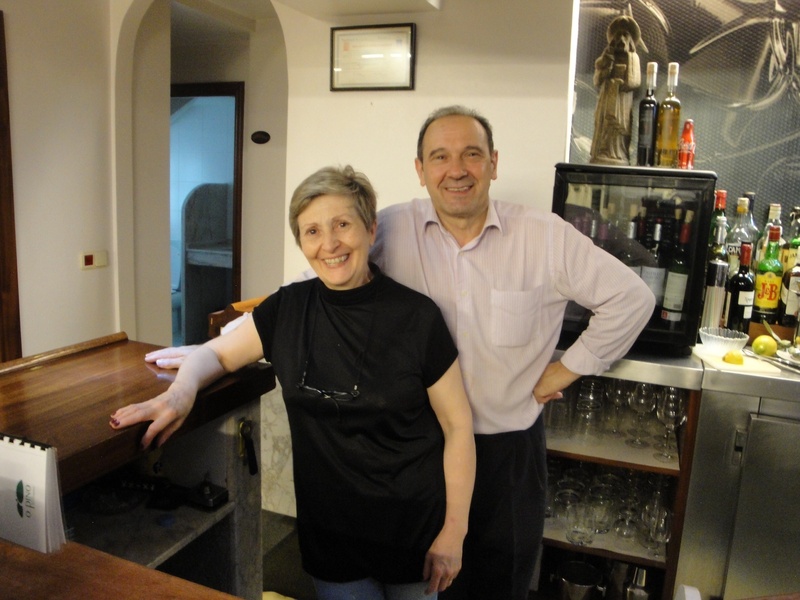 The Hotel “O Pino” is a fine, older hotel with exceptional, friendly service, comfortable rooms and delicious food. Ramon and Maria Carmen are gracious and warm hosts. Like seemingly all the other Alberques, Hostels, and Hotels, the staff typically consists of two people who do EVERYTHING. They claim that they sleep. I’m not so sure. Anyway, we had our best breakfast on the Camino, buffet style, so we loaded up for our final walk. We took some pictures, looked at each almost incredulously saying to each other, “can you believe this is our last day of walking?” Off we went. There was a very light drizzle with overcast skies but the air was not cold. As we were leaving this village a woman was following a very playful dog that ran up to us. I told her she has a cute, playful dog. She responded that her cute, playful dog likes to run away and she’s been trying to retrieve him for the past 30 minutes. Quickly we were back in the woods following the ubiquitous yellow arrows. 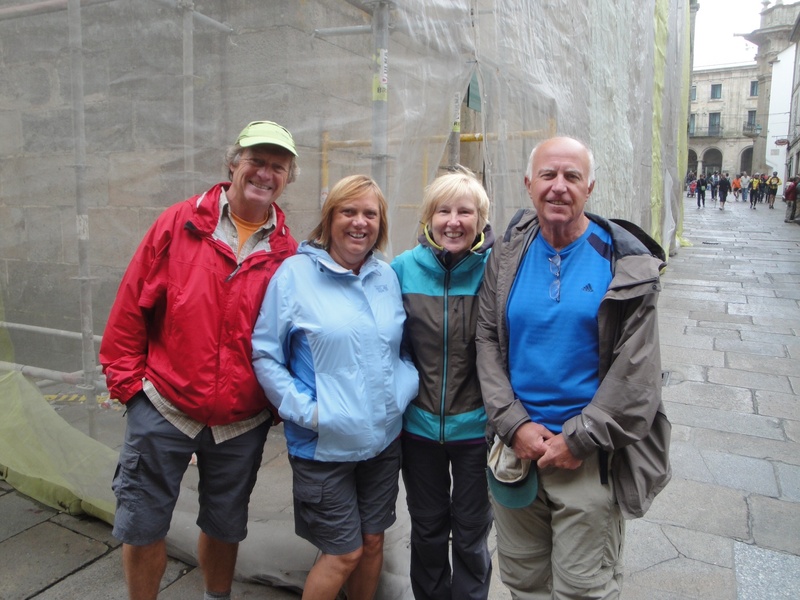 We made comments to each other such as which of our Camino friends we would see in Santiago. Heike and I continued to get into a few deep discussions about family. Heike would then walk with Andrea for awhile and I would be talking to Nancy about what we would be doing next after the Camino. We walked past a family from Utah consisting of a Mom and Dad and their daughter and son in law. I spoke to a man walking as a trio of men from Lugo, Galicia who started in St. Jean Pied du Port. One of his highlights was witnessing a wedding when he reached La Cruz de Ferro, the highest point on the Camino. I also spoke for awhile with a woman, Madeleine, from Cologne, Germany who also started in France. She was walking the Camino to discern how she wanted to continue with her self employment. We continued with the rhythm of the Camino. At times walking with complete strangers exchanging a few words or no words, “buen camino” as we passed them, talking to people we’ve already met on the Camino from previous days or weeks, walking alone, walking next to a loved one, walking with a Camino friend, but walking, constantly walking with an occasional stop to take a picture. We made a rest stop. The girls hit the toilets, they had a cafe con leche, I had a orange flavored KAS drink (I prefer Fanta but it’s primarily KAS in Galicia), we paid our bill, had our Credencial stamped and returned to what we’ve been doing really well lately, walking. We could hear jet planes taking off in the distance. We knew we were getting close. Those jets were taking off from the Santiago airport. Before too long, we were walking parallel with the runway. I took a picture of a jet landing. 1015 Sunday morning. We soon realized that although we were still walking in a wooded area we were actually walking around the airport. 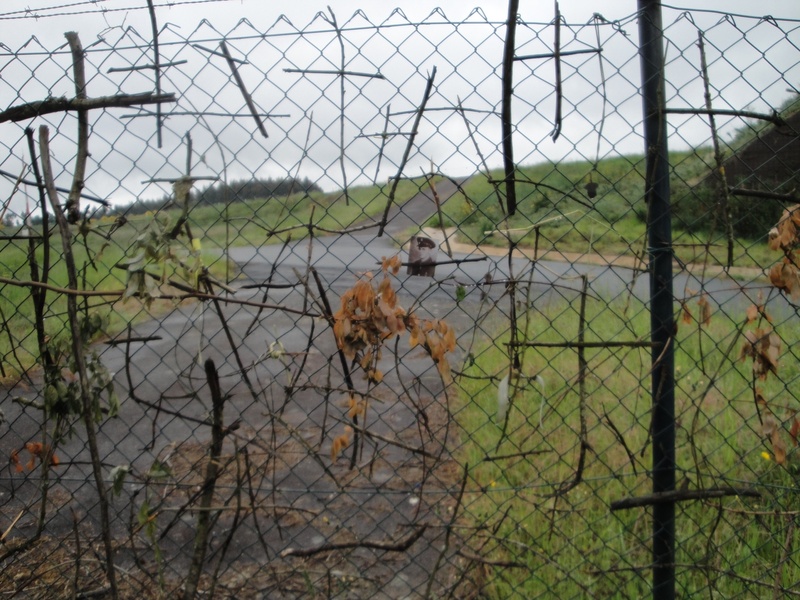 When we approached the fence at the end of a runway I saw the fence covered with makeshift wooden crosses similar to what we saw last week or was it two weeks ago? I don’t immediately recall. The days are really starting to blur. We made another pitstop for cold drinks, cafe con leche and a bocadillo for Andrea, she was really hungry. Walking everyday has really given her an appetite! We moved on going up another hilly area. I walked next to a young woman from Barcelona who is walking the Camino like many Europeans do, in segments. She was walking with a girl friend. We made way for some pilgrims doing their Camino on bikes. My walking pace has picked up over the last few weeks. My personal rhythm is a steady pace that is faster than most but certainly slower than some. Up ahead at an intersection we heard a Galician band playing what sounded like Celtic music with Galician style bagpipes. Very interesting and a reminder of the strong Celtic influence in Galicia. I quickened my pace so that I could get a picture of the band playing from the bed of a pick up truck. We turned left still following the yellow arrows and Andrea shouts out, “there’s Janice! 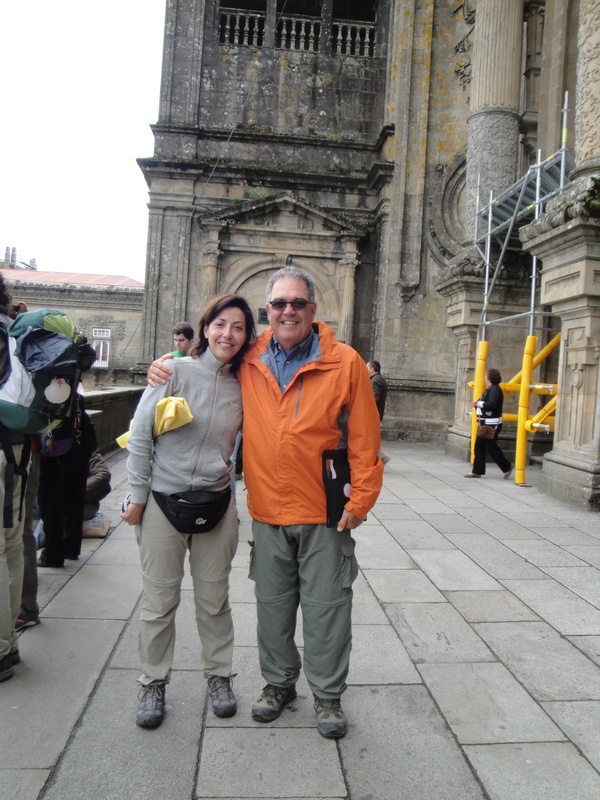 There’s Adel!” My uncle and aunt, Adel and Janice Sanchez had been planning on experience their own Camino. They’re sharing this experience with very dear friends of theirs, Charlie and Paula Glendening. Although we made Camino plans independent of each other, we knew that there would be a possibility that we would meet each other in Santiago if we arrived at about the same time. They left from Sarria about 10 days ago. We inadvertently caught up with them about 7 or 8 kilometers outside Santiago! The Camino truly creates amazing experiences. We stopped for a quick visit then resumed walking. I reached the point a few days ago that as long as I walked, my feet were just sore and tired but relatively pain free. When I stopped for a few minutes or longer, my feet became painful and it would take me about a half to one kilometer of walking to get back to a normal gait. It literally hurt to stop walking. Before we knew it we approached the Monte de Gozo overlooking the city of Santiago! We walked up to the monument at the top of Monte de Gozo and then Heike and I saw the Santiago skyline below us. We smiled and hugged. Nancy and I smiled and hugged. We were all smiling and hugging. Although we weren’t there yet, Santiago was literally within sight! After a few pictures at Monte de Gozo we resumed our walk with more resolve than ever. We waved goodbye to Adel, Janice, Charlie and Paula as we moved on to Santiago. There was a sign indicating the St. James Cathedral was 4.6 kilometers away. At this point, the four of us could have done that on our hands, if necessary. Figuratively speaking of course! We walked steeply down hill toward the city. As we entered the city I was immediately reminded of the day we left Burgos 24 days ago. The weather was very similar with the overcast skies. Thankfully, it was much warmer in Santiago then when we left Burgos. It had taken us 24 days to walk from Burgos to Santiago. We walked through the city as we were reminded of city life, with the traffic, cars whipping by us, families out on a Sunday afternoon. We walked passed a church in which Mass had just ended. We spoke to an old lady sitting on a park bench who wished us a buen camino and that we continue to walk with God. We were getting closer, I was getting anxious. The girls made one more pit stop and then we started walking through what was clearly the older, historical part of the city. There were a lot of people. Locals, tourists, pilgrims. Then I heard Andrea shout, “Dad, look it’s Thomas!” Thomas is the young German pilgrim who was walking the Camino with his father. The had started in St. Jean Pied du Port. Nancy, Andrea and I met Thomas in Burgos the day we arrived in Burgos. 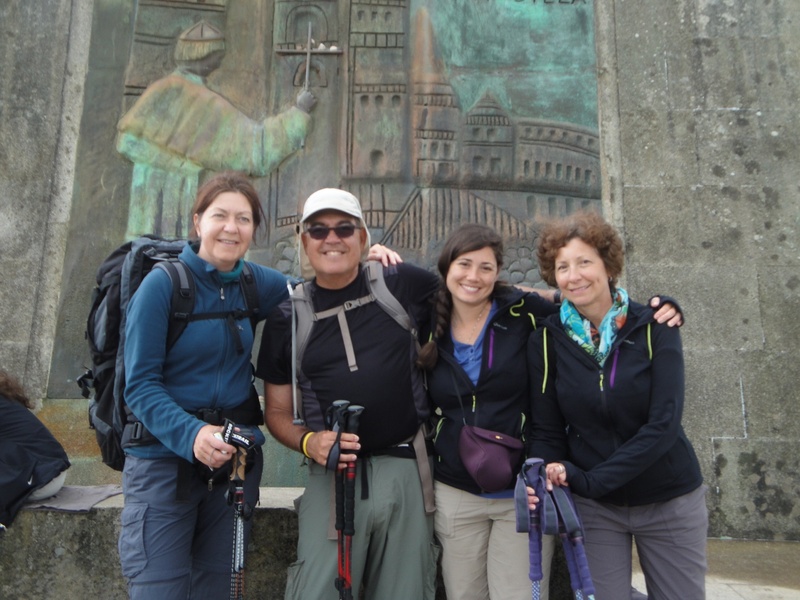 Thomas had met a young woman, Claudia from Austria who was walking the Camino with her mother. They were all leaving Burgos the next morning. A day before we left Burgos. Thomas was the first pilgrim we met in which we had an extended conversation with. Is it a coincidence that the first familiar pilgrim we see in Santiago would be the first pilgrim we had an extended conversation with in Burgos? The Spirit of the Camino is REAL!! We started walking up hill again through narrow streets. We kept walking then finally entered a small plaza but we could see that we approached through the back part of the Cathedral. We walked through a portico, down some steps, turned left and there we were, in the expansive Praza Obradoiro and the Cathedral of Santiago! We arrived! We made it! We were amazed at how big this Cathedral is. We were all a little surprised but also in awe of the scene. Pilgrims hugging one another, pilgrims sitting on the plaza soaking in the experience of what they had just accomplished. Nancy, Andrea, Heike and I just looked all around us also in awe of what had just happened to us. Not a lot of words spoken to each other. Just smiles, hugs, kisses and pictures taken in front of the Cathedral. Then the familiar faces started appearing. We went into the Cathedral briefly. We approached the altar, sat in a pew and the four of us each went into our personal thoughts and prayers. I prayed and gave thanks for a safe journey and for all that I had experienced. Andrea looked at Nancy and I with emotion in her eyes saying, “we made it! can you believe we made it!” We left the Cathedral then walked toward to the Oficina del Peregrino (Pilgrim’s Office) and got in line to receive our Compostela. While in line we saw Jana, the German woman we met several weeks ago on the Camino. I saw Natasha, the young, German woman who is in the German Army who was part of the Germans who gave Heike and I such a warm welcome (and noodle soup and wine) the day Heike and I walked 40 kilometers. We gradually moved along. It took us about 40 minutes before we finally were face to face with the person who was instructing us on filling the form in front of us that was documenting our name, our nationality, where did we start on our Camino, was our Camino for Religious, Religious and Other, or Non – Religious. The young spanish woman evaluating my Credencial looking at the stamps asked me where I started my Camino. I told her walking 500 kilometers across Spain was a dream of mine that I was so grateful to be able to do. She looked at me smiling and saying you had a good Camino. “Yes” I responded, “I had a very good Camino” and then the emotions started welling up as my eyes got wet. It was indeed a good Camino! Ramon and Maria Carmen at the O Pino Hotel. Warm and exceptional service! Our last morning of walking! 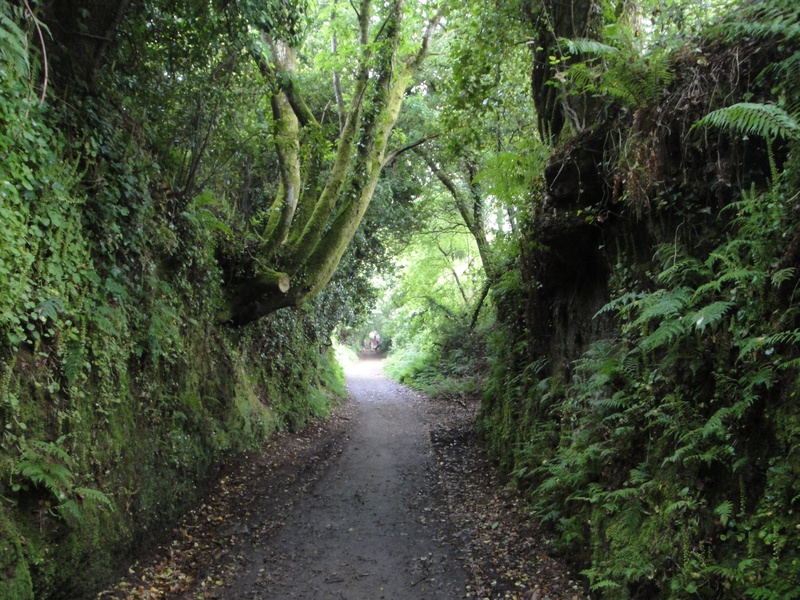 We were still treated with more beautiful, lush Galician woods before reaching Santiago. We’re getting close! 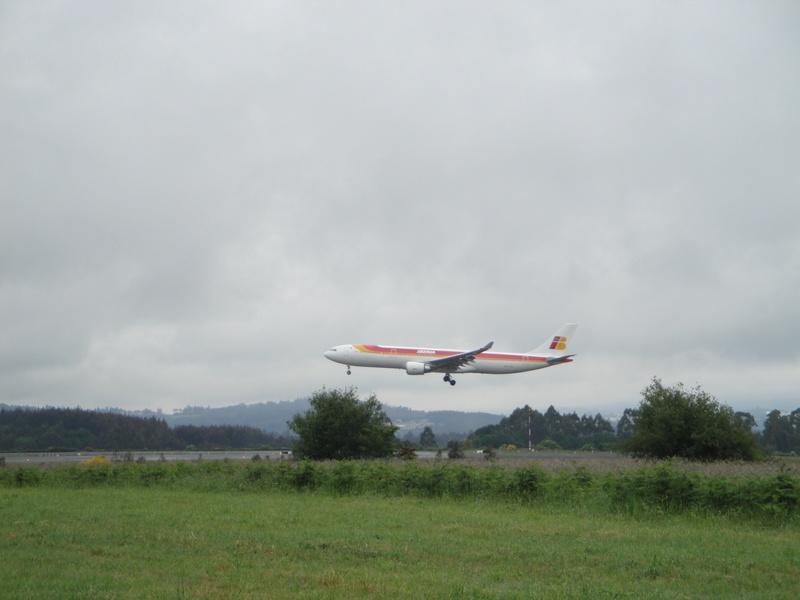 A plane landing at the Santiago airport. Another display of makeshift crosses we’ve seen on fences along the Camino. 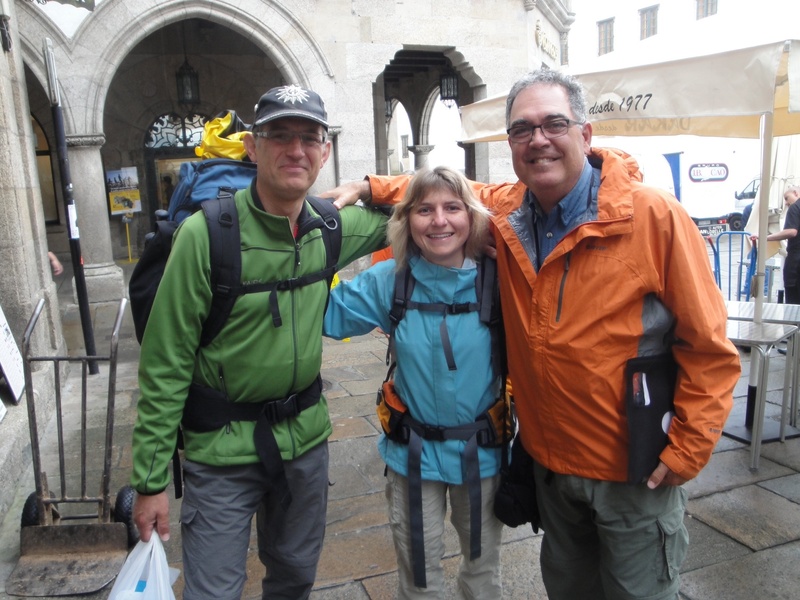 Meeting my uncle and aunt on the Camino. Should we really be surprised by now? Top of the monument on the Monte de Gozo, Mount Joy, overlooking Santiago. The four of us by the monument on Monte de Gozo. Should we really have been as surprised as we were to see Thomas again? Heike, the Camino Queen, Champion’s League! We accomplished this pilgrimage as a team and as a family. Buen Camino!